Caolan Mooney has informed Australian Rules club Collingwood that he intends to leave, with a return to the Down gaelic football squad on the cards. The 21-year-old has spent three years in Melbourne but the Rostrevor clubman is set to join fellow Mourneman Martin Clarke in coming back to Ireland. Mooney, an outstanding underage player, who won two MacRory Cup winners' medals with St Colman's Newry will attend UUJ. Clarke has yet to decide on his future with the Down squad. The 2010 All Star spent six seasons with AFL giants Collingwood in two spells, having also played football for the Mourne county in 2010 and 2011. 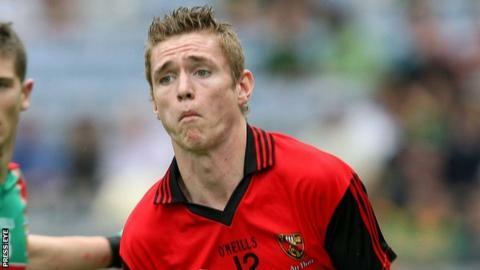 However the 2005 All-Ireland minor winner will not make up his mind whether to commit to Down until later in the year. A new manager will be in place in 2015 following James McCartan's departure. Clarke made a big impact when he last quit Aussies Rules football for gaelic football, playing a key role in Down reaching the All-Ireland final in 2010. He played 46 games in three years at Collingwood before quitting at the end of the 2009 season, spending two years with Down before resuming his AFL career with the Magpies in 2012. Injuries and a failure to secure a first team place this season have contributed to his decision to return home after completing a second three-year contract. There is speculation he will play Sigerson Cup football for Jordanstown next year as he is keen to begin a degree in teaching.